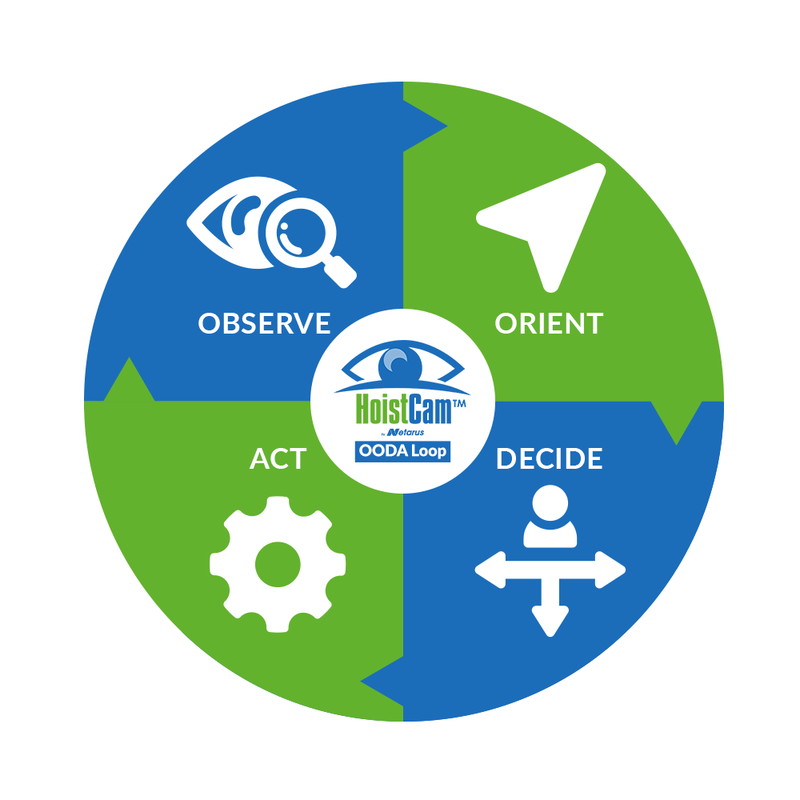 The following is a list of case studies involving various types of situational awareness platforms including HoistCam engineered and manufactured by Netarus. Description: This case study goes over the installation of the HoistCam, and shows the view from operator’s cab and the video from the HoistCam. The goal of the HoistCam is to increase the visual line-of-sight for the crane operator on long distance lifts and especially during blind lifts. Description: The purpose of this video is to demonstrate what the crane operator sees from the operators cab. The HoistCam is attached to the hook block of the crane as the boom is relocated between two buildings. The video ends with the hook block located between the two buildings in the middle of a blind lift. Description: This case study combines the rapidly deployable wireless camera from Netarus first as a TugCam and then converted to a HoistCam. First, the TugCam is used while push a barge with a large marine crane. The TugCam gives the captain line-of-sight in front of the barge during the blind push. Once the barge with the crane is docked near the vessel to unload the cargo, the rapidly deployable wireless camera is mounted as a HoistCam. The HoistCam is mounted onto the hook block of the crane. The case study shows the view of the cargo and the deck of the ship during the blind lift. Description: The following case study is an example of how the HoistCam camera system for cranes can be used virtually anywhere in the shipyard. The HoistCam’s rugged housing and wireless transmission capabilities allows it to be placed anywhere. This video provides an example case study with pictures of how the rigger and crane operator use the HoistCam to assist them with a blind lift of cold rolled steel from inside the hull of a cargo ship. The results of using the HoistCam increased the safety rating above 90% and the efficiency of the unloading was reduced from 9 hours to 4 hours. This is a 55%+ increase in productivity and efficiency. * This increase in efficiency was due to the lift no longer being a blind lift from inside the hull of the cargo ship. Description: Beside giving direct line-of-sight to the crane operation, the HoistCam remote web access feature allow managers and site supervisors to view the site from the HoistCam’s point of view from anywhere in the world. All of these capabilities are included in just one system. Manage your projects better with visual information in seconds from any mobile device from a close-up HoistCam perspective. Using any PC, Apple, Android or Blackberry smartphone or tablet, managers and supervisors can get valuable site information in a matter of seconds from a HoistCam’s perspective. 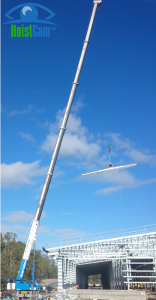 Description:Using a boom tip mounted HoistCam, QClad Pty Ltd had over 15,000m2 of insulated roof panels to install with an all terrain crane. When working in such conditions, the crane operator often has to perform many blind lifts, which can take up a great deal of time, cost a good bit of money, raise the chance of damage to equipment, and in some cases even increase the risk of injury to those in the area. While safely performing these lifts has always been a priority to QClad, doing so can be expensive. Since safety is first and foremost at QClad, they set out to find a way to speed up the process without sacrificing that safety. Description: This detailed video and case study provides an overview of the Mi-Jack MJ100 rubber tired gantry crane of how the system is installed and the view points from the operator’s cab. The ability to simply see the pins going into the top holes of the containers and being able to see the legs on the opposite sides of the crane significantly increases safety and productivity for the operator. Often used in many intermodal applications, this solution presented in the video and case study also demonstrates how HoistCam can be used with container loaders and reach stackers. HoistCam mounted near the pins enables the operator to see the pins of the spreader bar aligning with the top of the container. Description: This case study features an implementation on a tower crane in the UK demonstrates the versatility of HoistCam within a construction setting. Description: This case study features a steel mill picking rolled steel with their cranes. Without visual guidance, the hook from an overhead gantry crane goes down into the center bore of the roll. Contact with the bore damages the steel and requires the roll to be redone. HoistCam is featured in this case study to significantly increase safety and productivity for their crane operators. This case study is available in both English and Spanish. 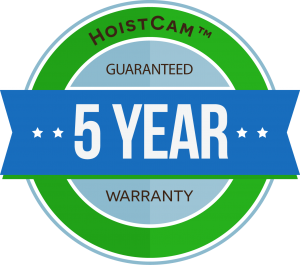 *HoistCam is a safety aid and not intended to be a replacement for standard crane practice. Care should be taken to make sure all proper safety and operational procedures are followed. These articles, videos and case studies do not guarantee that your organization will have the same results. Individual results may vary based on effort, experience, conditions and other unknown factors.